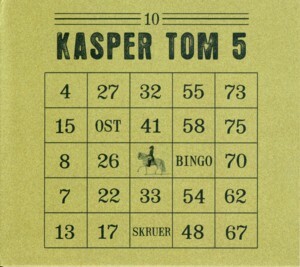 This is the debut album by the European Jazz quintet Kasper Tom 5Find albums by this artist, led by Danish drummer / composer Kasper Tom ChristiansenFind albums by this artist, with German clarinetist Rudi MahallFind albums by this artist, Polish trumpeter Tomasz DabrowskiFind albums by this artist, Swedish trombonist Petter HangselFind albums by this artist and Danish bassist Jens Mikkel MadsenFind albums by this artist. Christiansen and Dabrowski are also members of the excellent Hunger PangsFind albums by this artist trio. The album presents ten original compositions, six of which were composed by the leader and the remaining four are credited to the entire quintet. The quintet is constantly walking on a tight rope between "usual" and "unusual", which is of course great fun. Seemingly a standard quintet and yet the brass section features a completely nonstandard bass clarinet / trumpet / trombone front line, which has a completely different sonority from a regular saxophone dominated ensemble. Seemingly playing melodies, yet there is actually more freedom and free improvisation than one might expect or even be able to hear upon the initial encounter. This stuff requires some serious listening in order to be properly digested, which is usually the case with unusual music. With all the freedom and group improvisation involved, this music is surprisingly "easy" on the ear, mainly because it is completely non aggressive, even in the most passionate moments. The flow of the music is all natural, following a melodic theme or a harmonic sequence, often even introducing several complex intertwined leads, but always executed with grace and obvious mutual respect and understanding between the quintet members. The whole proceedings are a rare example of group members that actually complete each other rather than compete between each other. There is no obvious leader; nobody gets more solo space than anybody else, in short a wonderful unity is achieved herein. Of course the album is also a superb display of individual skills and talents, but those can be truly appreciated only with repeated listening sessions, allowing the listener to concentrate on a specific instrumentalist rather than listen to the entire ensemble. One way or another, this album is full of wonderful moments, which are simply waiting there to be discovered. With young European Jazz musicians like these one can look forward to the future with at least some optimism. The renaissance of ambitious music in Europe is truly heartwarming, against all odds and like an oasis in the desert of mediocrity that modern life pushes down our throats. Well done indeed!